William of Mass Destruction: Elliott The Calm. I know it's getting close to that dumb time change again. Mom has tried to fool us by making us wait about 30 minutes longer for dinner, but she usually caves way earlier than that due to the constant harassment by the two non-black cats here (and which usually begins about 3:00 in the afternoon). You can draw your own conclusions about patience and fur color. 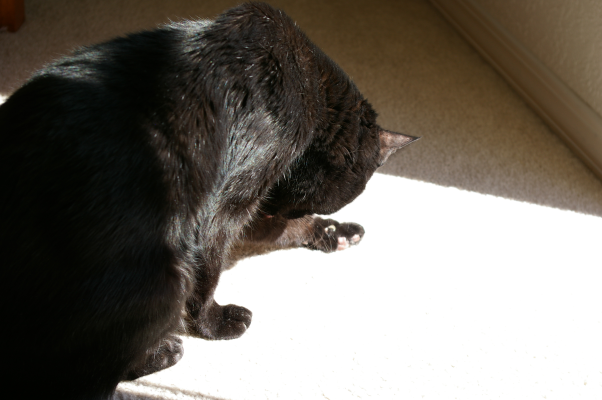 All I do is wash up and enjoy an open window with the late sun until dinner. Sorry dinner will be late. Stupid humans messing with the time. Dinner is always late here anyway! Maybe it will be on time when the clocks fall back. Well, a kitty can hope. Dinner is late here too. We need to band together and get petition. We had the clock change last week. It just means I cook earlier and my tummy thinks it's the same time. Maybe you should get your food earlier too. My mom just goes between the times sorta, and feeds me on the half hour till she moves it up. xoxo Mom said to say she was in a parking lot at the very top so the car wouldn't get mumps and bruises...and the lady in the opposite row didn't look before she backed out. Ow. Poor Mike, the car has a big dent. But him headed to get it fixed 12/4. We also do not like this stoopid time change thing. We are lucky we dont get fed on schedule. That whole time thing makes the crew crazy! But I get fed on time because...they know better. Cool dude (we have a senior who thinks every trip to the kitchen is breakfast/lunch and dinner. Yeah,dad just got out of bed and realized it was actually it was an hour earlier than the coffee maker said it was. He'd forgotten about turning the clocks back. It'll give him more time on here now. Happy Sunday! Cats avoid such foolishness as daylight time. It's either nap time, play time, or meal time. Yep! Cats don't need a clock to tell them when dinner is! We admire your patience E!